All of the above pictures were taken by my boyfriend, who is also responsible for Halloween-scaping my house. 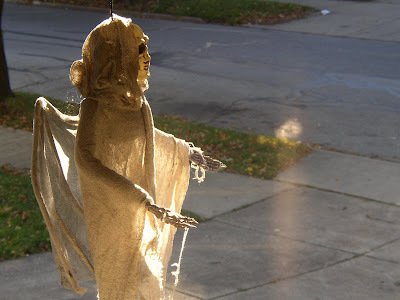 May you all have more treats than tricks today... and maybe even find a warm place in the sun to rest your weary bones. For the record, I want it to be known that I definitely would have made it until November 1st without turning on the heat if left to my own devices! Really. I made it through last night's cold without a problem (thanks to an extra blanket and a dog snuggled near my feet) and the house temp had made it back up to 65 by late afternoon. Nothing colder is in the schedule from now through Thursday, so I figured I was home free... until my boyfriend walked in and announced that he felt chilled, and a little like he "might be starting to get sick." *sigh* Game Over. 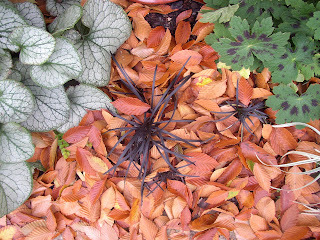 He left for a few hours after supper to go teach fencing lessons, so I turned the heat back down to 60 and headed outside to clean up the less artful leaves--these gorgeous beech leaves get to stay in the shade garden for a while yet, since they set off the black mondo grass so nicely--and get a few more things planted. 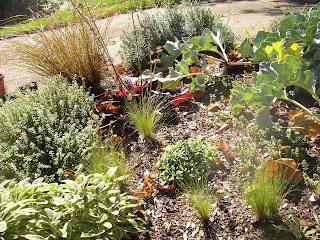 I am embarrassed to admit that part of my "fall cleanup" this year involved temporarily planting a whole flat of pint-sized herbs, which were probably purchased on sale in late July, into the veggie garden. 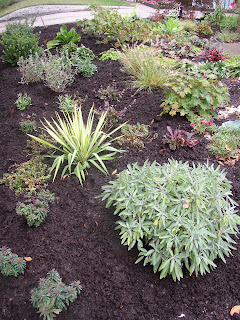 As I dug holes for sages and lavenders, I was reminded of a post that I had begun back in May about using tough plants like these in my West-facing front garden. Going back, I discovered that I actually had three draft posts that I had never finished. 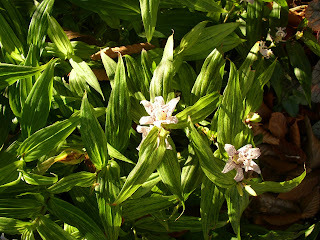 The "Tough Plants" post from May, midsummer musings on gardening in the vernacular, and a recent post about transparency both in the garden and in blogging. I have figured out why I never posted these three. The "Tough Plants" one felt too much like a how-to, when it was meant merely as a chronicle of my struggles with my Western exposure. "Gardening in the Vernacular" requires me to do a little more research on garden history and architecture in order to help crystallize my own thoughts there. And I have rewritten the "Transparency" post numerous times in an effort to remove any misconception that my words pass judgment on other bloggers. 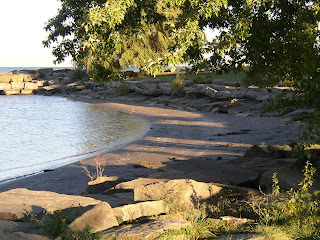 As part of my fall cleanup, I have given myself some new homework: To resurrect and finish off these draft posts. Finding them got me thinking, though... how many other bloggers have post orphans like mine? Begun and then saved with good intentions to complete them "soon." 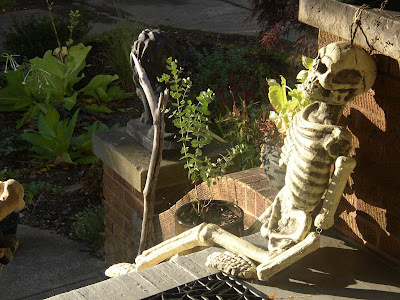 Noticed when the next few posts are written but continually shoved aside in favor of the latest garden events. Finally, they drop off the visible part of the post listings page and fall victim to "out of sight, out of mind" syndrome. It's too easy to forget unfished posts for me to believe that I'm the only one who has them. Anyone else want to share my fall cleanup homework and give their orphan posts a proper introduction to the world--or at least, share here that you have them to make me feel better?! 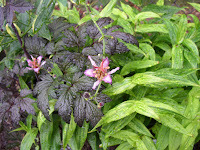 Late this afternoon, a brief respite between raindrops allowed me to sneak out and take photographs of the new front yard garden. Gardeners' Glasses (similar to rose-colored glasses, these help you to "see" the finished, filled-out garden instead of the new planting presented in these photos) will help make it all look better, so please put them on before scrolling down further! It wasn't until I sat down to post tonight that I realized I hadn't captured the full front yard in its entirety. 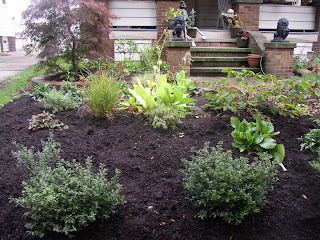 In this first picture you can see almost 2/3 of the new bed, tucked in with a layer of Sweet Peet organic mulch. Notice the 18in strip of grass that still remains by the sidewalk? My front yard slopes a bit from where the new bed begins to the sidewalk, and so I wanted to leave some of the grass to help retain the slope until the new plantings become well established. I'm toying with a couple of ideas for finishing off this front edge next fall, but want to wait until the plants fill out a bit and I can really see what might work best aesthetically. Here is part of the bed that you can't see in the picture above. In this corner, a grouping of Japanese holly will form a sort of hedge in the corner of the bed. I planted them close enough together that they will eventually look like one undulating mass of plant--think of the old, rounded yew hedges in old English gardens here--but the fine texture of the foliage should keep them from looking too "heavy." One of the hollies was even more root bound than the rest, however, and it started to die on me a couple of weeks before planting. I did some emergency root pruning and planted it in the back yard to let it recuperate and enjoy some TLC. If it recovers, it will go in the open space you see behind the two hollies in the picture... if it doesn't, I'll be taking advantage of the plant guarantee at one of my favorite nurseries and getting a new one this spring. Oh, and remember how I mentioned rearranging the plants multiple times before actually getting them into the ground? My first thought was to intersperse the evergreen plants with those that would die back in the winter. I thought I had everything set when I remembered that the amsonia are supposed to turn bright yellow in the fall... so I definitely had to move them away from the yucca. 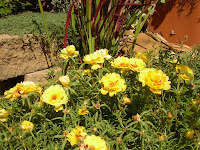 I was afraid that either the yellows would clash or that all bright color concentrated in one area would make a visual black hole there, sucking away interest from the rest of the garden. Altogether I would say that I spent about $100 on this bed expansion, not counting the mulch. 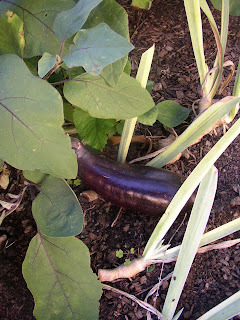 (I had that on hand because I overbought in the spring.) Not too bad considering the total includes (8) new shrubs and a fancy yucca that came in a 5 gallon pot. That I bought everything on fall clearance, and that the perennials were purchased in the smallest sizes possible, helped. In the last picture you can see how tiny the euphorbias are, for example--their tidy little buns of foliage didn't really even clear the edges of their 1 gallon pots. So there it is, my new, relatively low-maintenance front yard garden. I hope that in 3 years or so, when the shrubs all get a little bigger and the groundcovers carpet the soil below them, it looks like the garden I am seeing through my Gardener's Glasses right now. Of course, that would mean that I would have to actually not move any of these plants out of their current homes. I'm notorious for doing just that, so... well, we'll see how it goes! 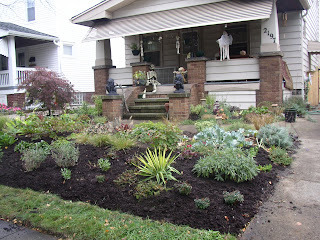 Lots of people have front yard gardens instead of lawn--I wouldn't exactly be a pioneer in creating a front yard garden, not even in my own suburb. 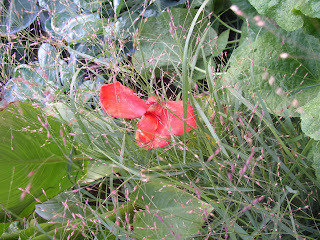 My reasons for wanting to eliminate the lawngrass are many and varied, some selfish and others almost noble. All are very viable, defensible reasons, though. So actually putting my plan into action should have been no big deal, right? Right. I mean, I'd already increased the front yard garden area exponentially since purchasing the house. I have been talking about systematically removing my lawngrass--not just this summer, but since I bought the house in 2004, for pete's sake--with a confidence that bordered on glee. 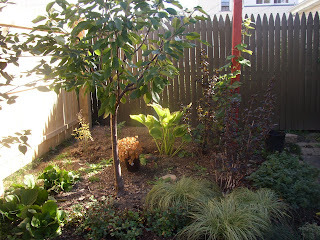 And I even purchased the plants to landscape the remaining lawn area during various fall clearance sales. And yet there I was, looking at the nursery pots all spread out over the grass, immobilized by my thoughts. All of the doubts that I had been keeping at bay began to tap on my shoulder one by one. 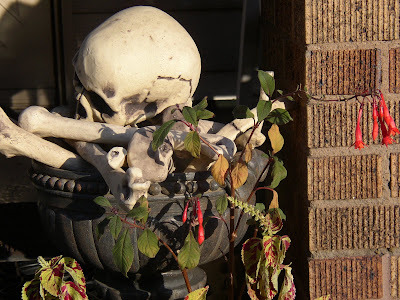 Questions about resale value and what, really, the neighbors would think swirled through my head. The grass looked greener than it has since I've lived there, as if it were thumbing its nose at me for "giving up" and deciding to remove it. 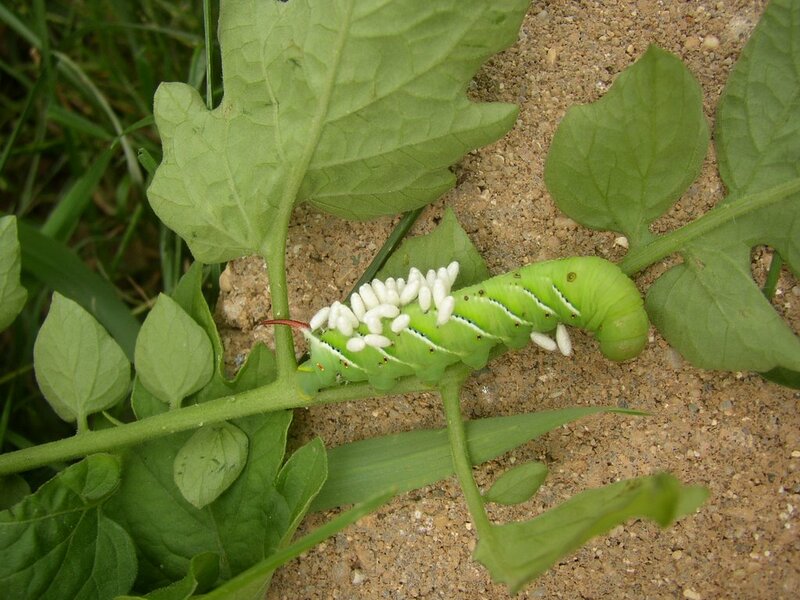 I swear that I could even hear my former father-in-law ask incredulously, "Really, Kim, you're going to dig up a perfectly good front lawn to plant these things? 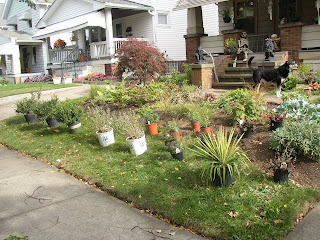 I changed up a few of the perennial pots, then walked to the far end of the yard to look again at the shrubs I had lined up. Clearly, I was procrastinating. I finally reminded myself that I would likely be here in this house for the next twenty years. Even if I have to rip everything out at some point and sow a lawn in order to sell the house... well, I figure that I might as well enjoy having what I want in my front yard in the interim. I took a deep breath and plunged the shovel into the ground at an angle, tipping up the end to loosen the sod. Once I got going, the combination of work and repetition eased my anxiety. I started thinking about pleasant things, like how much less time I'm going to spend mowing and whether I should use something like Karen's beautiful eco-grass to edge the sidewalk and fill in the tree lawn. 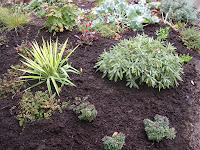 After finishing the hard labor, I decided that I just might have enough time to mulch the new bed as well. I threw the last shovelful of mulch just as the first solar landscape light popped on... so unfortunately I didn't get any "after" pictures to share. That will have to wait until tomorrow. But I did have just enough fading daylight to allow me to admire my handiwork. I stood in the exact same spot on the front sidewalk where I had wasted an hour earlier in the day, but this time I felt much less like a fraud. I didn't just talk the talk, I walked the walk--and I have an interesting new front yard to show for it. My back aches, my arm muscles resemble Jello... and still, I feel very, very good. I have had a long weekend, seemingly full of discoveries. Brian and I found a wonderful old farm in Brunswick, Mapleside Farm, where you can pick your own pumpkins, bag your own apples and pears, take hayrides, go through an acre of corn maze, buy all manner of local jams/jellies/honeys/etc., and grin and the large number of tiny children who feel as though they really should be able to pick up pumpkins that weigh almost as much as they do. 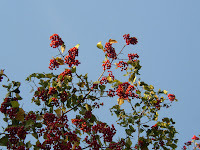 I have discovered that some trees (thanks to Kylee, I know this to be a hawthorn) couple beautiful berries and intimidating thorns. 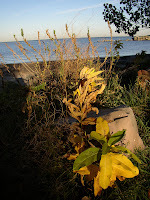 Also noted is that the foliage on some varieties of asclepias turn a bright yellow in the fall. And lastly, I have discovered that when you find yourself thinking, "This is really a stupid thing for me to be doing," you have approximately 30 seconds to rectify the situation before something bad happens. For example, say you are climbing around large chunks of rock at a local park with your dog (who is on an extendable leash) and you have the above thought. Please remember that you do NOT have time to take a picture of your cute dog after she jumps down from the top of a 4 ft tall rock onto the beach. If the situation is not fixed immediately, a large seagull may swoop past and your dog will give chase, as dogs tend to do. 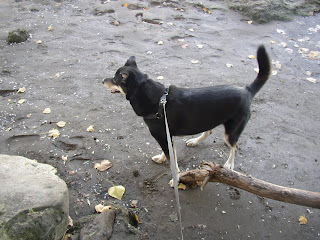 You will have a split second as the leash runs out to choose whether to jump off of the large rock yourself (and risk spraining something) or dig in your heels somewhere in a possibly futile effort to contain 90 exhuberant pounds of dog. I can't tell you what will happen if you decide to try the former, but I do know that if you choose the latter you might discover how much flesh a large, seemingly smooth rock can shred. Suffice it to say that your discovery will happen the hard way and will require at least 7 bandaids to cover. You may also have to cut off a dime-sized flap of skin when you make it back home. You will probably wish that you could discover why--seeing as how you are a very coordinated, athletic kind of girl--you keep having accidents that leave you looking like a 7-year-old who's been having trouble learning how to ride a big-kid bike. And then you will wonder why they always seem to happen at bad times. After all, it's tough to harvest 6 plants' worth of Roma tomatoes, plant all of the shrubs and perennials you still have to get into the ground, and complete your digging projects with a bandaged hand. 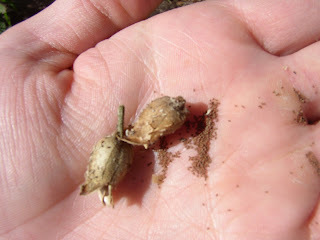 I was very excited to find seeds for Mexican Feather Grass, stipa tenuissima aka nassella tenuissima, earlier this spring. For the past couple of years I have noticed its lovely fine foliage in garden pictures and admired the way it gracefully arches sideways in the wind. I potted up a few milk cartons and stuck them outside with the rest of my winter sown pots. They sprouted late--possibly set back by the early April snowstorm--but I did end up with half a dozen seedlings by the end of May. My front yard seemed the perfect place to site these seedlings. 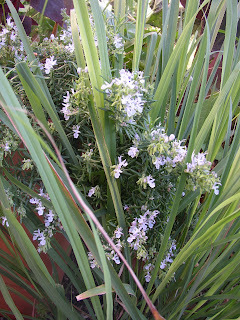 Mexican Feather Grass is supposed to be fairly drought tolerant, and my other xeriscape-friendly plants thrive there. It is a Western exposure, so I imagined they would look like long ponytails (Ponytail grass is another of its common names) whipping around in the wind, adding lots of movement. 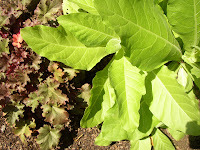 There are quite a few thick-leaved plants there, from purple salvia lyrata to the glaucous leaves of sea kale, crambe maritima. 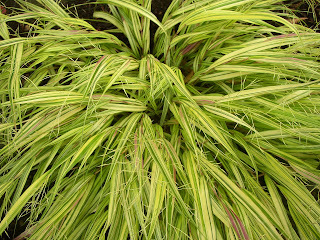 Some grasses, including carex buchannii and 'Hameln' pennisetum, were already in residence in that bed, but I was counting on the Feather Grass to add some more fine texture. 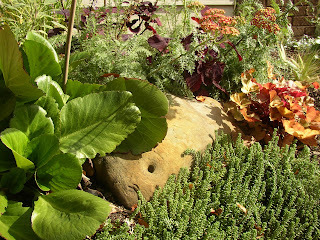 Its pre-flowering fresh green color would be a nice stepping stone between the dark greens of Spanish foxglove and the golden tones of variegated sage and the chartreuse 'Aureum' oregano. 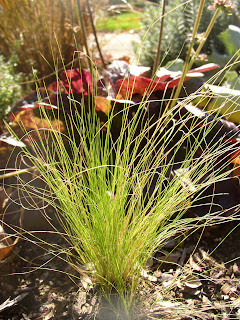 Even though they were first-year plants, I admit that I did not water my feather grasses perhaps as much as I should have early on. In my defense, it was hard to remember to water them as they sat, small but uncomplaining, amongst the water-shunning likes of lemon thyme, lavender and sedum. 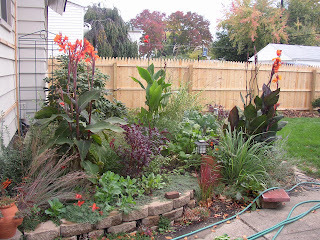 As you can see in this picture, they never did get taller, flower or fill out--nor did the silene maritima 'Compacta' that I planted in the center of them to act as something of a "ground" for the grasses. 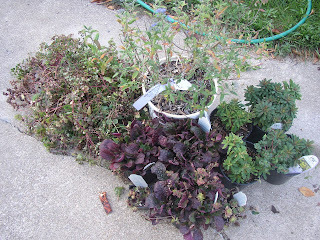 The silene was a last minute addition, so next year I'm going to try something else there instead--possibly a short salvia like 'Marcus,' a moody 'Matrona' sedum or maybe a wine-red portulaca. 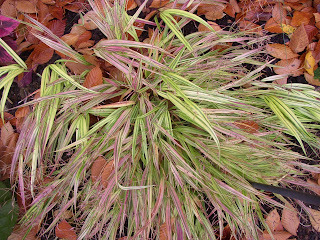 As for the Mexican Feather Grass? Well, what happens to it over the winter remains to be seen. I've seen it listed as hardy to zone 5, but my seed packet more conservatively lists it at zone 7. 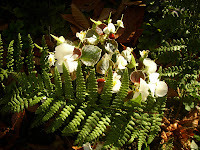 One reviewer on the wonderful DavesGarden website is in an Ohio zone 6 like me and says that first year plants seem to come back the next year for him/her, while plants that have flowered die off over the winter. That gives me hope... but I'll wait and see. 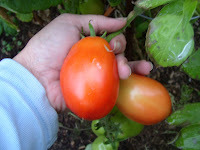 So many people were nice enough to offer me advice on how best to ripen my tomatoes this late in the season--and I am happy to report that a few of them are now starting to turn red out on the vine! ... when all of a sudden, a flash of dark pink caught my eye. 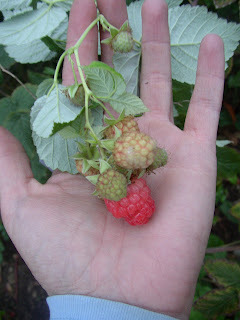 I went over to investigate, and discovered a cluster of ripening raspberries! 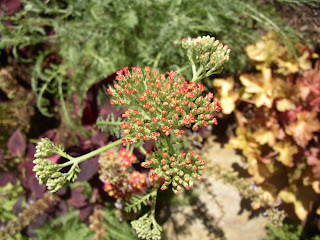 These are from a 'Canby Red' that I purchased on clearance in July and finally got in the ground in August. Needless to say, I didn't expect to see any fruit on it until next year. I don't know how many of these will actually ripen, but it looks like I am going to enjoy at least one homegrown raspberry yet this year. Yum. Even before the calendar flipped to 10/15/07, Blog Action Day had a positive effect on me. Obviously, it prompted me--along with the 15,860 other bloggers who signed up to participate--to think about the environment. I had felt compelled to put up a post explaining my reasons for joining Blog Action Day once the banner ad appeared here, and was surprised by the positive reaction it received. Many people left thoughtful comments that sent my mind swirling. I honestly had no idea what I was going to write about here until Sunday morning, 77 hours into a crazy 85 hour work week. As I drove in to the office, my mind raced back and forth between finishing my latest garden project and finding a subject for my Blog Action Day post... until finally I realized that maybe my tired brain was trying to tell me something: My latest garden project is actually a great illustration of how the burden we put on our natural resources can be lightened just by rethinking your day-to-day approach. Allow me to start with an explanation: When I find myself stuck in one of the conundrums of modern life I often fall back on the "Three R's" that we learned in grade school: Reduce, Reuse, Recycle. Reuse is my favorite "R," for several reasons. It does not involve sacrifice, and it's much more creatively challenging than tossing an item in the proper bin to be picked up, melted and reformed. Instead, I can help it be reborn as something else entirely... and I like to think that these items are as happy as I would be to have my useful life extended in such a way. And so it is that I have an old radio cabinet in my garage, serving as my potting bench. And my wheelbarrow is an ancient but perfectly balanced tool that the elderly gentleman several doors down decided to retire in favor of a new model. My next rose, 'Buff Beauty,' will be trained against an old porch railing that I trashpicked on my way home from volleyball this spring. And so on. My latest Reuse project involves some trashpicking, too. I was lucky enough to come across some industrial shelving that was marked for either the recycling center or the dump. Some of the shelves matched in color, but others did not and there was an assortment of sizes. I obtained permission to take the whole lot of them home with me for the "cost" of loading up myself and hauling them away. I wasn't sure just how I would use them in the garden, but I knew I'd figure out something. I have always liked the use of industrial elements in small urban gardens. Instead of making the garden seem like an oasis in the desert, disjointed from its surroundings, it has the effect (for me) of tying the surrounding city into the garden and anchoring it with a sense of place. 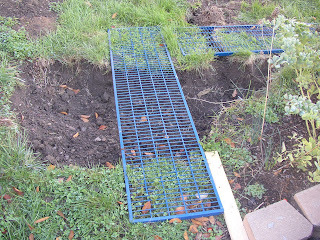 I was ecstatic to see that there was enough of this wonderful, blue-enamelled rack shelving to use as a pathway in the far half of the back yard. They are too small to use to create a wide, generous pathway... but when you want visitors to take their time navigating through a garden, you don't always want a wide path. A thin path with an interesting layout and/or breaks in the materials will cause visitors to slow down, and that's just what I need here. To inject a little more fun into the whole project, I am digging out a series of what I like to think of as "locks" because of our proximity to the old Ohio-Erie Canal. (I have walked the canal towpath many times since I arrived here in NE Ohio.) The shelves will span some of the locks like so many bright metal bridges. Water-hued plants, including groundcover sedums, silene maritima, and ajuga, will be planted in the locks to provide even more color. 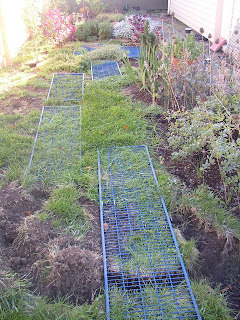 Small grasses like blue fescue in the "shallows" will help tie the locks in with other plants beyond the locks' edges. Instead of buying new block for a path, I'm reusing old materials. Instead of adding more solid surfacing to my garden, my new path will be porous and allow rainwater and runoff from the garage to percolate through the ground instead of being diverted into storm sewers. Lawn grass all around will be replaced with plants that will hopefully remove even more carbon monoxide from the air and provide sustenance. And some shelving that is old and no longer needed for its originally intended use--but is still sturdy enough to bear the weight of a human being--has found a second life. So in the end, I get a unique, colorful path in my garden that adds a real sense of whimsy to my yard... and I get to feel good about the environmentally friendly way in which it was created. This illustrates how taking a look at any project or item with "new eyes" might result in an interesting discovery: Maybe it's not as hard as you think to do some of those "little things" for the environment that really add up... and sometimes it's even more rewarding than the "conventional" way to go about it. Sounds like a win-win situation to me! I do my best to live as consciously as I can, and my interest in nature began at a very young age. Science was a favorite subject in school, and I spent my first year of college convinced that environmental engineering would be my life's calling. 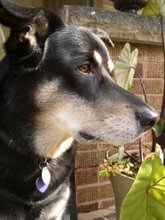 I garden organically and am working on eliminating my lawn. With all that said, you may wonder why the enviro- movement has somewhat "lost" me along the way... well, I'll tell you: I detest the superior attitude of some of those who have "found Green," so to speak, and find some of their elitist attitudes to be incredibly counterproductive. I'm sure I'm not the only one who keenly feels her inadequacy when studied with the judgemental eye of the Eco-saint. I can't be the only who hangs her head and thinks, Eeyore-like, "Little old me. What difference did I think I could make, really? Why should I bother?" And that leads me to why I signed up to do a post on Blog Action Day. Call me Pollyanna, but I signed up because ultimately, I believe that the little things matter. The point of Blog Action Day is not to get a million people to change the bulbs in every light fixture they own--or some other equally grand gesture. No, the point is for each blogger to relate the environment to his or her usual subject matter and illuminate the issue in many small but personal ways. It may eventually create a light just as bright. So what am I going to talk about on Monday? I really don't know. But I can tell you that you won't be getting any fire-and-brimstone or pep-rally attitude here. I don't feel very comfortable rabble-rousing or getting up on a soapbox, and I am definitely not fit to cast the proverbial first stone. No, I'd rather be here at ground level, digging around in the dirt for inspiration.. appreciating the little things and the many shades of Green, and sharing whatever delightful things I find. 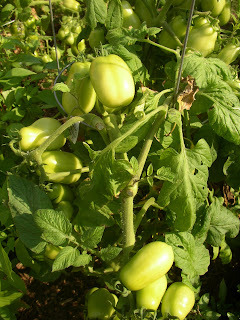 I haven't blogged about my tomatoes yet this summer for a very good reason. 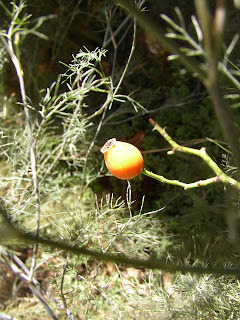 Other than the garden snackers--er, cherry tomatoes--most of them have not yet ripened. How can this be? Well, I am too embarrassed to tell you exactly when I finally got them into the ground, but suffice it to say that it was a lot later than I should have! Memorial Day is usually my tomato planting time, but this year they went into the ground closer to the next big summer holiday. *gulp* Since I knew I was planting very late I stuck with already established plants and strictly planted paste style tomatoes since they ripen fairly early and keep well. The picture here shows what the vines looked like this morning: loaded with fruit, all still sporting a shade of yellowish green and nary a speck of orange, even, in sight. Today's high will be 86 and tomorrow's high will be 88, but then the highs drop back down into the 70s. So... expert tomato growers, what do you think? Is there any chance that I still may get ripe tomatoes this year? Should I instead cut the vines and hang them upside down inside to see what they do? I actually have some grasses and shrubs on standby, waiting to be planted in these spots, so any thoughts that anyone might have would be much appreciated. I don't mind being patient if there's still a chance that I may see enough ripe tomatoes for one big batch of freezer sauce... but if the situation is hopeless I will instead serve up some fried green tomatoes, yank them out and plan to get next year's crop in the ground in a more timely manner! Coming home from running errands on Tuesday night, I passed an interesting-looking pile of trash. My car slowed down and pulled into a driveway several doors down in spite of the little voice in my head saying, "Come on. 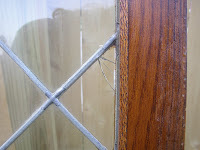 That's not really a leaded glass window! Who would throw that out? It's probably just one of those interior bifold doors where the plexiglass is doctored to look like it's leaded." "I knew it!" My boyfriend laughed, "As soon as I saw this, I knew you'd turn back to look." Well, good thing I did. 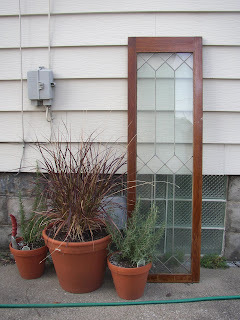 It's not quite a leaded glass window-- but it is an oak cabinet door with leaded glass! Many of the old houses around here were built with these cabinets surrounding a large dining room window. I can't see where the knob used to be on the "good" side, but on the interior you can see the telltale holes from the hinge hardware. Why would someone throw out anything this cool? Good question. Apparently they were annoyed by these two little cracks in the glass... even though I couldn't push any glass pieces out when I tried. I wasn't sure what I was going to do with it when I first brought it home... but upon measuring I discovered that it happens to be 5ft tall. My own large picture window happens to be 5ft wide. So even though its panes are hexagonal and my own leaded glass windows have oval designs I think it will look lovely hanging at the top of my dining room window. 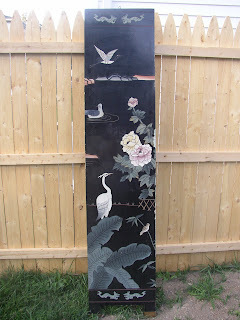 When we picked up the leaded glass, we found these interesting Asian screen panels stacked up underneath it. There are four of them, with these carvings on the front and a simple line-drawing-style carving (brown lines on a black background) on the reverse. The feet of each panel are brass, but they must have hung from something as well because there is an eyebolt at the top of each panel. One panel looks like a fist went through the line-drawing side and cracked a bit of the ornate side. 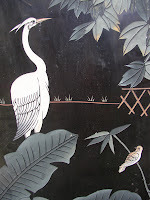 I don't particularly like the soft colors but I like the cranes and leaves... so I'm going to fill in the crack and repaint the panels to liven it up and hide my fix at the same time. Not sure where they're going quite yet, but the repair will be a winter project so I have time to think about it. Here you see (4) 1-gallon euphorbia 'Efanthia,' (3) 1-gallon 'Purple Volcano' savlia lyrata, (2) pints of hens-and-chicks, and (1) 5-gallon 'Petit Bleu' caryopteris. All are destined for my front garden, where I hope that they will happily reside near the likes of culinary sage, oakleaf hydrangea, and 'Golden Sword' yucca. 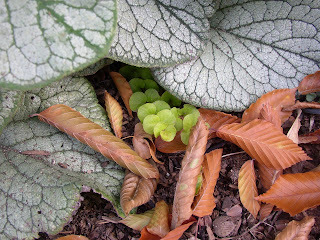 The giant pile to the left of the shrub and salvia consists of euphorbia flowerstalks. They had become so unwieldy and top-heavy that I'm sure many people didn't even know what kind of plant was under all of that stuff as they perused the clearance aisles. I was amazed at the amount of detritus produced so I included it in the picture.